Wednesday, May 5, 7 p.m.
Second in the Sonic Series, this two-part program explored the illusion-conjuring power of sound with perception researcher Dr. Diana Deutsch and radio dramatist Tony Palermo. 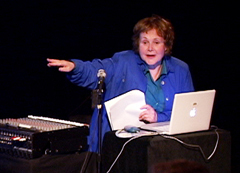 Dr. Diana Deutsch presented a series of sound perception illusions and curiosities. With one technique, listeners began to "hear" words and phrases that were not really there—an example of how the brain generates “phantom words” in an attempt to extract meaning from chaotic sound. In other illusions, Deutsch repeated a spoken phrase several times until it appeared to be sung and highlighted how different listeners perceive even very simple musical patterns in strikingly different ways. Dr. Diana Deutsch points out how dramatically our auditory perception differs from person to person. How does sound evoke a place or an action? In this auditory odyssey, Tony Palermo pointed out the strengths and limitations of auditory perception as he demonstrated mechanical sound effect devices. Palermo invited the audience to participate in interactive story-telling using sound and to test the outer limits of sound's capacity to evoke an altered state. Tony Palermo turns ordinary objects into extraordinary sound effects. Dr. Diana Deutsch is a professor of psychology at the University of California, San Diego who conducts research on the perception and memory of sound and music. She has discovered a number of musical illusions and paradoxes, including the octave illusion, the scale illusion, the glissando illusion, the tritone paradox, and the cambiata illusion. Deutsch also explores ways in which we hold musical information in memory, and how we relate the sounds of music and speech to each other. Much of her current research focuses on the question of absolute pitch—why some people possess it, and why it is so rare. To learn more about Dr. Deutsch's research, go to: http://www-psy.ucsd.edu/~ddeutsch . 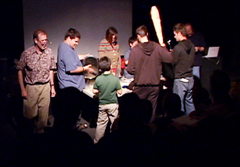 Participants became instant sound effect artists in an audio drama. Tony Palermo, a Los Angeles-based radio dramatist and educator, has created dozens of programs for public radio, audio publishers, the Museum of Television & Radio, and others. 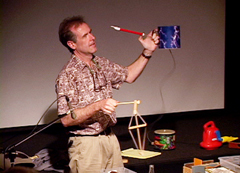 He is the resident sound effects artist for the Wells Fargo Radio Theater at the Autry Museum of Western Heritage, as well as a composer and audio engineer. Palermo hosts the Radio Drama Resources website ( http://home.sprynet.com/~palermo/mtr_radi.htm ), which provides tips on how to produce radio shows and make sound effect devices.